Research papers on international business and discuss engagement by governments in international business transactions for either profit or political purposes. Courses on international business require research papers that focus on globalization and the many other MBA concepts that discribe today's business climate. The business writers at Paper Masters specialize in international business and want you to know they can help you write research on any international business case or company that you need to focus on. In a world where boundaries between countries can, at times, seem insignificant, international business is the driving force behind this sense of interconnectedness. When at least two nations, countries, or regions participate in business transactions, whether in the governmental or private sectors, it is said to be an example of international business. Governments often engage in international business transactions for either profit or political purposes; private sector international business transactions are almost exclusively done for profit. These transactions can involve goods or services; the resources involved can be information, people, or capital. W hen companies have vested interests in numerous countries, they are said to be a multinational enterprise; these brands are often recognized around the globe and have become a ubiquitous part of our shared culture. 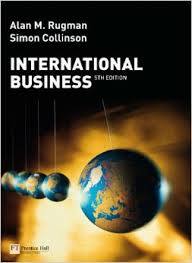 International business does not only impact the financial activities of the public and private sector. Instead, international business has repercussions in the political, sociological, legal, economic, cultural, and educational sectors, among others. When two or more countries interact, cultural transactions can take place through the movement of a product to another region, linguistic changes can emerge from new words and terms being added to a regional lexicon, and quality of life can be markedly changed for the positive or the negative based on the interactions of these various corporate entities. Globalization is a highly useful concept for understanding the complexities and uncertainties of the current environment for international business. The International Business environment is marked by diverse unpredictable and fast-moving changes that seem quite chaotic unless one applies the concept of globalization as a means of providing some order and structure to the challenges and opportunities that one faces. The concept of globalization provides an important framework for understanding and interpreting the unprecedented and ceaselessly and rapidly evolving transformations of the current international environment. The most important lesson of globalization and its associated processes is that information, insight, and foresight are now more important to success than ever before. In a fast-changing global environment where new but fleeting opportunities are constantly emerging in hotspots around the world, and where formidable challenges and challengers continuously change shape and direction, access to key information—and the keen ability to promptly use that information to one’s advantage assume—ever more critical importance to the prosperity, and even to the very survival of international businesses. Advantage of International Trade Stimulation - International trade stimulation has many advantages when a nation is allowed to focus on the goods and services it can produce efficiently. American Council of International Strategies - American Council of International Strategies Research Paper looks at this travel organizations environmental and SWOT analyses. Business in China - Business in China research papers ask if China is a solid financial investment for business. China’s Accession to the World Trade Organization - China’s Accession to the World Trade Organization research papers discuss a sample of how to order a project for a master’s business level class. Global Supply Chain Management - A Global Supply Chain Management Research Paper delves into a sample of an order placed for a project with specific structure when completing the project. Globalization of Markets - Driving force behind the world economy is technology due to the ability of nations and markets to communicate, transport and travel. Japanese Companies - A Japanese Companies research paper previews a way for helping to set up your order for Business Papers, giving details and clear instructions. Japanese Entry into Global Market - Global expansion of Japanese companies in developing countries. Merging With a European Firm - A Merging With a European Firm research paper looks at how to place a Business research papers with giving detailed instructions. Global Leadership research papers focus on the elements necessary to fully understand the various effects of globalization of countries and societies around the world. Paper Masters writes custom research papers on Research papers on international business and discuss engagement by governments in international business transactions for either profit or political purposes.